Idealspain spent a couple of days in Carmona in September 2010. This wonderful town has the most amazing friendly atmosphere as well as some fabulous buildings and monuments. The people of Carmona made us very welcome. 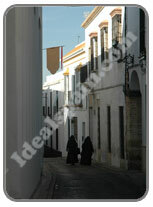 Carmona is in the province of Seville and locaqted just 43km from Seville. The town is built on a ridge overlooking the central plain of Andalucia. It has a thriving trade in wine, olive oil, grain and cattle. Carmona has a wonderful plaza in the centre, the San Fernando Square where many of the local residents meet. There are several small bars around it's edge. From this square, narrow streets spread in all directions. There are churches in every direction and their spires dominate the skyline. Carmona is a town easily explored by foot. Most of the important monuments are located within the centre area. If you start at the Alcazar de la Puerta de Sevilla, you will find the tourist office where you can pick up a map. Most monuments are located to the east of the Alcazar. There is an abundance of Roman remains in Carmona, some of them, the finest in Andalucia. The Alcazar de la Puerta de Sevilla is the most important building in Carmona and is a must see. Tickets to go up the tower are obtained from the tourist office (2 euros and 1 euro for concessions). From the tower you can see the whole of Carmona and miles beyond. Remains have been found on this site dating from the 14th and 15th centuries. Much of the remaining tower dates from Roman times. The reception centre on the ground floor has an exhibition centre. The Alcazar del Rey Don Pedro is located high on the hill, overlooking Carmona. It houses the parador de turismo hotel. Built between 1350 and 1369 it housed a spacious palace. 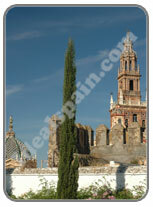 Building of this splendid church began in 1424 and it was designed to be an imitation of the cathedral in Seville. The main altar of this church is of particular interest as it is highly ornamental and is in plateresque style. The many chapels within the church contain valuable works of art. The most splendid piece is the painting of the Virgen, dating from around 1300. Other important pieces include the painting of the Apostles by Zurbaran. In total there are over 150 pieces of gold and silverwork, embroidery, literature and paintings. The convent was founded in 1460. Much of the success of the convent is attributed to Beatriz Pacheco, Duchess of Arcos who left a huge will to the convent on her death, making this religious community one of the richest in Andalucia. Much of the building is in Mudejar style with some unique features. The main altar is of Sevillian Baroque from 1645. The bell tower and watch tower were erected in the 18th century. Carmona, the Roman town Carmo, was the strongest Roman city in the time of Julius Caesar and its strength was much improved by the Moors. The 15th century tower was built in imitation of the Giralda in Seville. This is one of the first things you see in Carmona. This gate was erected between the 1st century BC and the 1st century AD on the northeast side of the city. This is the point where the Via Augusta exited the city in the direction of Cordoba. It was originally built with three openings for pedestrians and carriages, flanked by two octagonal towers. Over the centuries the gate has been remodelled and refurbished several times. The north tower was rebuilt after being destroyed by the earthquake of 1504.